Happy Monday friends! I hope you had an awesome weekend. Today I'm going to show you how I sewed the cute corner ruffle duvet in my brother's master bedroom. It went together pretty quick and took WAY less time than E's ruffly duvet. I started with a white duvet cover that I bought from Target a while ago. It was in my teenager's room until he got a different one. I unpicked the bottom and one of the sides of the duvet. 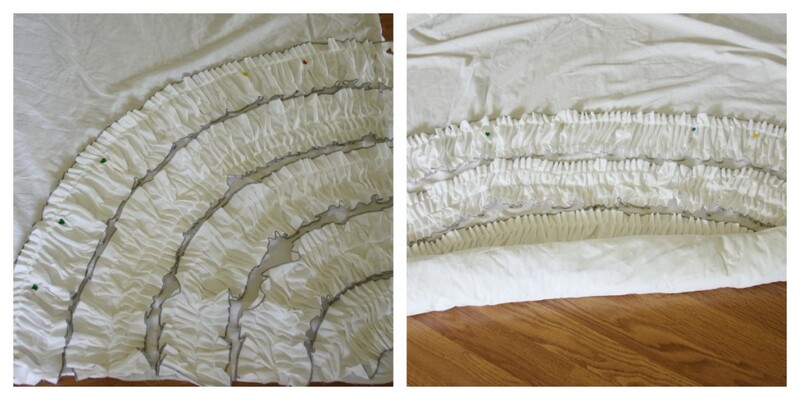 Then I cut a 4" strips of white fabric (I used leftover scraps from E's ruffled curtains). The strips were as long as the scrap king flat sheet I used (about 100"). I had 10 or so 100" strips. Then I used my serger loaded with gray thread and set to a rolled hem stitch. Every serger is different but the book that came with your serger should have the settings for your machine. I serged up both sides of all the strips. After I finished serging the rolled hem onto my strips I ruffled them. 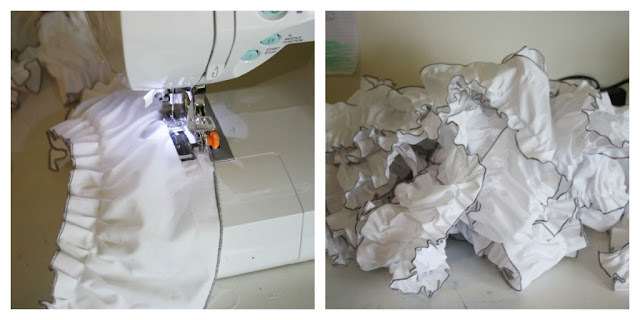 I used my ruffling foot to ruffle the fabric. Best sewing purchase ever if you love ruffles! The ruffler takes a little getting used to but my biggest tip is to make sure the presser foot is DOWN. 98% of my ruffling errors occur when I forget to put the ruffler in the down position. Then i just started in the bottom corner of my duvet and pinned the ruffle in a little curved shape and trimmed the ruffle so a little was hanging over the side and bottom edge. 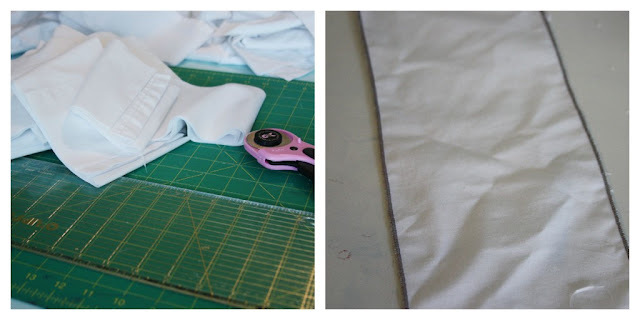 The little hanging over the edge is important because when you sew your duvet back up you want that sewn inside the duvet and can trim the excess later. I sewed that ruffle right down the middle to attach it to the duvet. Then repeat and pin and sew the next one. I found it easiest to sew each strip on before pinning the next one. As the ruffles get higher up the duvet it gets a little harder to work with all the fabric. I rolled from the corner of the duvet up to make it less bulky to fit in the machine. If you mess up and accidentally sew some of the extra fabric while sewing on the ruffles then try to stay calm and unpick. I swear I spend as much time unpicking as I do sewing. 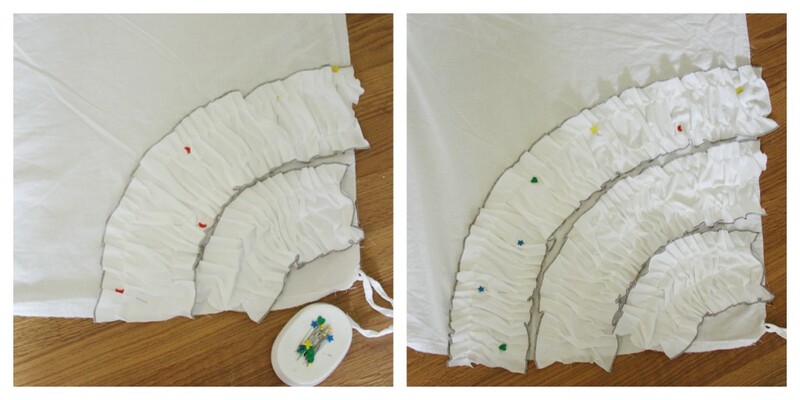 After all the ruffles are sewn on just flip the duvet back inside out and sew up the side and bottom that you unpicked earlier. This project took me about 4 hours. 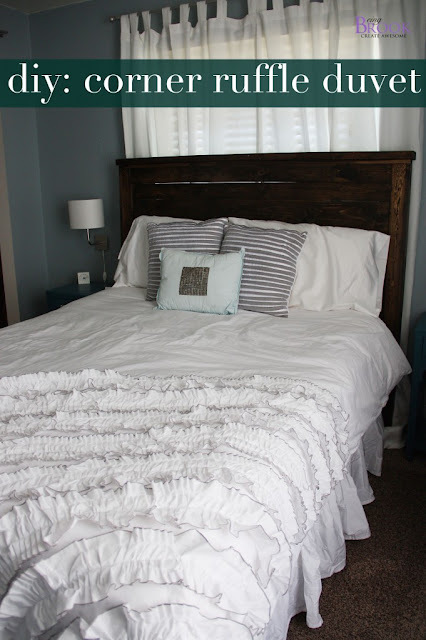 I love the white bedding with the dark walls! I'm sure my brother LOVES his white ruffly bedding. LOL. Well at least his wife does. 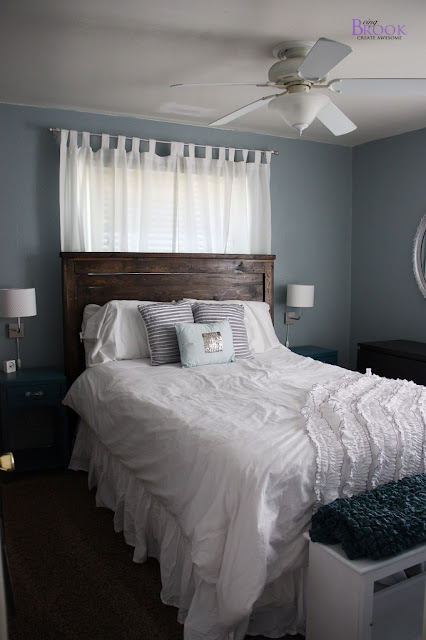 The gray pillows on the bed are from Target in the dorm section and were only $12 each and the little aqua/silver pillow was from Kohl's forever ago and used to be in my Master bedroom. What have you sewn lately? Do you have to unpick projects as often as I do?